Blah blah blah women get paid 73 cents for every dollar a man makes blah blah blah. Yay for stats. That's actually not what annoys me. It's the fact that you can't watch a new broadcast about the upcoming election without hearing about what Hilary Clinton wore. Why is that relevant? They never talk about what Trump is wearing... Because nobody cares. Because he's a man, and his wardrobe isn't up for public discussion or scrutiny. Why is the way a woman dresses an indicator of how good she'll be at her job?! Then there's the annoying #bossgirl and #bossbabe hashtags that have become so popular with millennials. Again with the appearance nonsense! Why is "babe" used to describe a female boss? Why do they need to make a "cutesy" hashtag by putting girl in it when we're indeed women? We don't call male bosses "boyboss." That sounds ridiculous and juvenile. So does girlboss, ladies. See, sexism is so ingrained in our culture that young women take it and accept it as "cute!" or "fun!" when really, it's just reinforcing the old glass ceiling. Sigh. And these are the same young women who claim they "don't need feminism." Ohhhhhh, boy. Yes. I'm passionate about feminism. And I'm well aware that I, and all women, need it. I went to an excellent public school growing up. My public high school was nationally ranked. I got an amazing education at the University of Minnesota too, a top 25 public research university. In fact, I believe in public education so much that we bought our house in a very specific location so that our kids could go to a great public elementary! I'm not here to hate on private schools, but I don't think the ability to swing a private school's tuition should be the barrier to a great education. All children deserve access to a great education, regardless of socio-economic status. I'm so passionate about public ed, I spent two years of my professional career fundraising for public schools. Sounds funny, right? I bet you're thinking that because they're public, shouldn't they be fully funded by the public? No, they're not. And so many schools face cuts each and every year. It's demanded that they produce higher test scores and offer the best extracurriculars, but are forced to do so with less and less funding. 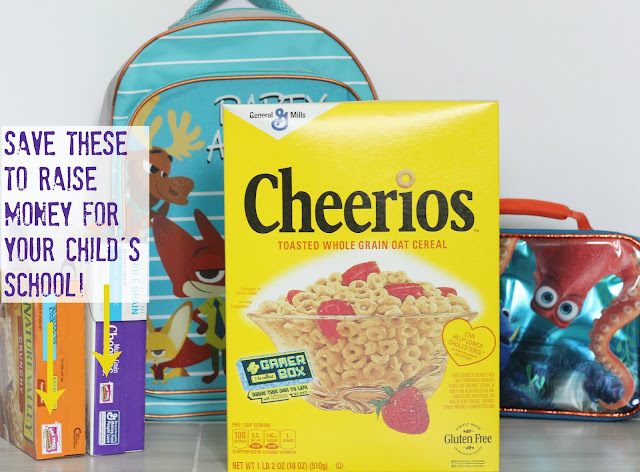 In comes H-E-B and General Mills' Box Tops for Education! It's really simple: You purchase your favorite General Mills products (at H-E-B if you're in Texas!) and save the top section. Register your school online and when you turn in your tops, your school gets dollars. Such an easy way to help your school get more money. And private schools, you're not excluded - all schools can register! Bonus if you're a Texas resident like myself: Go to this site and register your school, and you'll be entered in a H-E-B sweepstakes for your school to win 20,000 bonus box tops - a $2,000 value for your school! 20 Texas schools will win, and the more you enter, the better your chances. Go for it! Better believe I put my son's school on the list! Yup. Passionate about accessible, quality public education for all. You know those Facebook friends (or real life friends) you have who are always in a rush, always frantic and there's always something crazy and bizarre happening to them? And they either dominate the conversation with all their chaos or they air it out on social media in every detail. They always seem to end with a "why is this my life/me/happening nonstop"?! Well, I can tell you. You create your own chaos, friends. Things in life are a series of events and how you CHOOSE to react that that event. You create chaos by reacting wildly/with a bad attitude/frantically/negatively/and on and on. If you're wondering why your life is consistently too busy, too crazy, too out of control or too dramatic, look at what's happening and examine your response to it. Sometimes you can control the events in your life and sometimes you can't, but you can ALWAYS choose how you react. If you're constantly drained, tired or stressed out from your own life, choose to react to it differently. You'll be surprised how quickly you become happier again. One of my favorite analogies for choosing your reaction is this: The skin is a semi-waterproof organ. When outside things come at you, let it roll off you like water rolls down your skin. When you're in the thick of something bad or negative, sometimes it helps to literally vision water rolling off your skin! Taking two seconds to visualize that means that you had two more seconds to let the event sink in as opposed to reacting to it right away. And that means you had two more seconds of peace! Yes, I'm really passionate about personal accountability, especially for your own happiness and the amount of busyness and chaos you allow into your life. This little guy chooses happiness... Most of the time, anyway! Those are just three things that I'm now not so secretly passionate about. I find it fascinating how we all have our "things" that really get us going! I'll talk your ear off about feminism, public education, and "being the ringleader of your own circus" if you will. What are some things you're secretly (or not so secretly) passionate about? What's Up With Your Kid's Fake Food Allergy? Why are so many parents self-diagnosing their children as having a food allergy? The other day, I left a morning yoga class and was slipping on my shoes. I overheard another mom talking to the next classes instructor, whom is a friend of mine. "We just determined Sally has a gluten intolerance! When she eats it, she gets so whiny, I can't take it. So we tried gluten free for a week and now she's not throwing any tantrums. You should try it with your kids too!" To which my instructor friend rolled her eyes and said, "I wish it were just a food that I could pinpoint for a tantrum cure..." She and I exchanged WTF glances and she went to in teach her class while I went on with my day. However, that one exchange prompted me to write this post, which has been on my mind for ages now: What's up with your kids fake food allergy?! Who are you to diagnose your own child as intolerant or all out allergic? Furthermore, why does everything need a diagnosis or a label? Now, before I jump in, I want to say this post doesn't apply to the kids who are legitimately allergic to foods. Not the ones who are lactose intolerant and get the runs with ice cream, and not the ones who break out in hives from shellfish and certainly not the ones who need an EpiPen (with it's new outrageous price tag to boot!) after exposure to peanuts. No, not them - those kids are legit. This post is talking about self-diagnosed allergies, not legitimate, clinically proven and even life-threatening ones. I'm not even talking about adults who notice a correlation between eating a food group and feeling gross, or gassy, or just off. Nope, when you're an adult, you can make all the rules you want about the food you consume! Eat what you want - or don't - It's no skin off my back either way. Here's who I'm really talking about. Comment one: "Brayson is the same way when he eats gluten! He goes from zero to sixty and I can't get him to calm down. We're now gluten free and I think I've seen an improvement in him." Comment three: "You know, we're getting Addison tested for ADHD because when she eats dairy, she's a complete wreck. Dairy just puts her off the charts. So I bet Sarah definitely has a sensitivity! You should get her tested for ADHD too - I'll give you my contact person at the clinic!" Ok moms. Let's get something straight here. You're talking about feeding your kid sugar filled yogurt and ice cream and you wonder why they're spazzing out on you? Do you know that yogurt has as much sugar in it as ice cream? Do you know how sugar makes the body (and mind) react? Of course your child turned into an a$$hole, you didn't monitor the amount they consumed, or if you did try to cut them off, I'm betting they threw a royal fit and you eventually gave in and let them eat to their heart's content. I'm using an obvious example for the sake of this post, but you could insert anything in place of dairy/ice cream/yogurt. Gluten. Peanut butter . Soy. Just go ahead and fill in the food demon du jour. I see SO many moms attempting to draw their own conclusions from their kids behavior after consuming a given food. They're attempting to diagnose their own children as having food allergies before they even ask their pediatricians about it. What is that about?! Don't even try to reason with these moms. I had an allergy test when I was a teenager. You know, the test where you lay on your belly and they drop concentrated oils of various substances over your back, then prick you with a needle to see what causes a reaction? Yeah, that test. That scientific test. When it's suggested in these mommy groups to go and have an allergy test done, not one minute will pass before another mom pipes in with, "Those tests are worthless! They don't test for sensitivities or intolerances. Just a full-out allergy!" 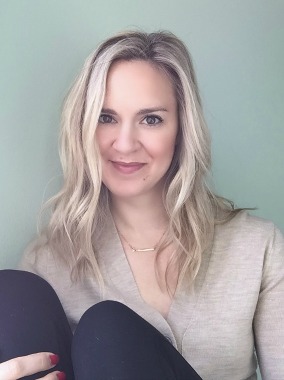 Why are moms (and other caregivers) always looking for a scientific theory (or allergy or illness or disorder) to explain what's going on with their children? It seems as if every little thing requires some sort of official diagnosis. There's not just attention deficit disorder, there's now a whole spectrum. There's not just food allergies, there are levels of intolerances. Hell, even gender is being put on a spectrum now, it's no longer just boy and girl. Are people creating more shades of grey, as it were, so that they can get more funding at their school for more help for their child? More interventions, more special attention? Or are they searching for a label so that when their child acts out in public, they can apologize and excuse the behavior with, "I'm so sorry - Sally is on the gluten intolerance spectrum and she had wheat crackers today!" Why can't your child just be having an off-day? What if there's something going on at school that's making your child behave differently? What if it's your parenting style and boundary setting that needs adjustment, not your child's diet? Perhaps that too difficult a question to answer for the moms in some moms groups. All of a sudden, it's super en vogue to have a food "allergy." I get asked ALL the time what my kids are allergic to. When I say, "Nothing. My kids can eat anything. But Henry hates sugar and meat." Other moms look at me like I've sprouted horns! Then they ask me what my "secret" is. Well, here it is folks: I feed my kids healthy, organic foods. We don't eat fast food, ever (ooook, lies, we get Chic fil a a few times a year.) I don't keep sugar in my house (this is true). The sweetest thing Henry eats is yogurt and graham crackers. It's not that he can't have it, it's that it's never in our home so he's never learned to like it! Other than that, there's only one food rule: We eat when we're hungry and stop when we're full. I'm no allergy specialist or medical professional; just a mom with a marketing degree. But apparently, my common sense approach to food is working for us. And if some day it stops working for us, I'll examine what environmental changes have happened lately that could be responsible for a change in my child's behavior. And if there's nothing and my child continues to act out or act up, I'll look at my parenting. And if that still doesn't work, I'll make an appointment with a food allergist. And if that yields nothing, I'll chalk it up to a growth spurt or a phase. And we'll continue to eat all the food groups in moderation. 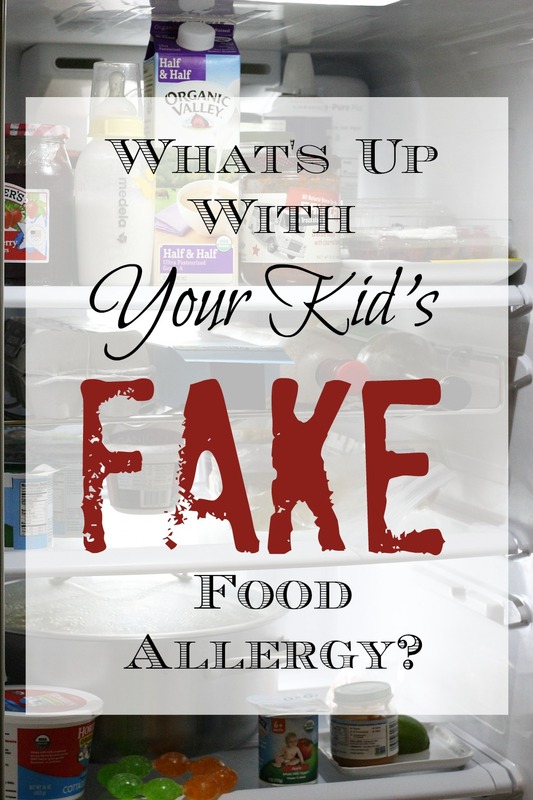 Because I just can't understand what's up with all these kids' fake food allergies. Warning (warning? That's not the right word but all that would come to mind): This post contains a ridiculous amount of pictures with ridiculous commentary. There is no point to this post - I learned no major "lessons" on my blog break, I have no pseudo-wisdom to share. I just decided I didn't want to spend our family vacation working/being attached online. That's it, that's all. And then I got some fun pics with my DSLR (first time vacationing with the fancy camera! ), so I thought I'd make a fun post about my blog break. 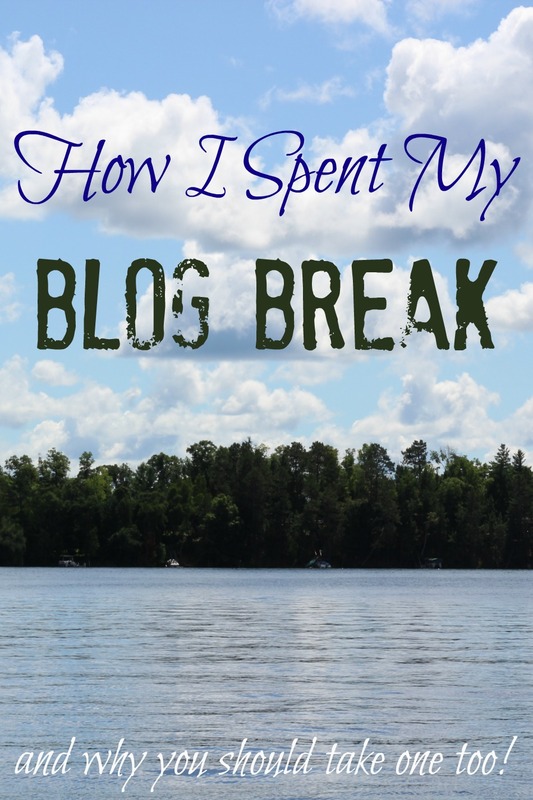 You're not going to get enlightened by reading this, I won't inspire you to rethink your blog or your life... But my toddler made some hilarious faces and my baby is adorable, so, you know. Read on for a good ol' fashion over-share post! We escaped the Texas August heat by going to my parents' lake home in Wisconsin. Unlike our last trip to Maine, there was only one travel issue, and that was hitting major road construction on I35 heading north out of Minneapolis to lake country. Like, dead stopped, nearly doubled our drive time level traffic, the kind Minneapolis is best known for (I don't miss that about living there!). Oh hey, remember when I said I didn't have any wisdom to share? Lied, here it is: Don't book a flight with a car ride immediately following if you have children. They don't handle it well, and it makes you crazy. But then we arrived and all was well! We had some perfect weather. My mom had food ready for us immediately and wine poured, like the champion she is. She had the cribs set up in her cabin so that she could get up with the kids every morning and cut us a break, even though my weird husband refused to take her up on that offer every morning. Who does that?! Meanwhile, I basically sprinted to the next cabin and locked the door, like love you kids but mama wants sleep, byeeeeeeee! Immediately the next day, hubs wanted to take Henry fishing off the dock . Now, anything that involves hooks, worms and sitting for long periods of time just isn't my thang, but I tagged along for the photo opps. Not touching that thing, dad. Nope. So Mr. Bass gets tossed back in and another worm sacrifices it's life all in the name of trying to get a toddler interested in fishing. The waiting game started again. And if you're wondering what that thing on Henry's arm is, it's a skull tattoo-thingy that lasted for THREE EFFING WEEKS. Don't miss that now that it's gone... Tangent ended, back to the waiting game! And right as Henry was about to dip up out of this waiting game nonsense, all of about one minute and six seconds after it began, another fish latched on to that worm/hook combo and spent the rest of his life regretting it... Because that fish swallowed the hook and passed on to another life. RIP, fish. On a brighter note, Henry either got over his fear of flopping fish or just needed a really passive (aka nearly dead one) to touch it and get interested in fishing. So little sunfish, your life was not in vain! After two fish, I was about fished out, so I went to go see what my mom had done with my lil baby Otto. Poor little dude, one day he'll be big enough to do boy things with the boys and not get handed off to Grandma while mom snaps pics and plays with ISO levels... But until then, he'll chill safely with Grandma. I found both Otto and my mom in their respective happy places: Playing with toes and drinking wine . Both of those happy places are more my speed, especially if the contending activity involves hooks and worms. When the glory of fishing wore off, or my husband got too tired of grabbing Henry's life jacket as he attempted to lurch off the dock and get into "da wadder, da wadder, da wadder! ", hubs took Henry swimming. My folks found this old boat tube and Henry got a huge kick out of it. Fifteen year old toy saw a return to it's glory days thanks to Henry! Now me, I don't get into water unless it's at least 100 degrees out. When I was a Minnesotan, that threshold was about 92 (give or take) but now that I'm a Texan, I need to be heat-stroke-level-hot to want to cool off. So I stayed in the 85 degree sun and got my first tan of the season. Yeah. It's August and I JUST got tan... Because it's too hot here to sunbathe. Add that to the ever-slimming list of things I miss about living up North. We basically "eat sleep rinse repeat"'ed that cycle the whole trip! We had two days of overcast weather and played with bubbles. ALWAYS WITH THE BUBBLES . They never got old and entertained both kids. Henry would honestly play bubbles for hours if we let him. It's the simple things, right? I think he's mentally building a shrine for bubble solution. He looks like he's about to tantrum - oh no, he's just passionately shouting BUBBLESSSSSSS nonstop. All day. Everyday. Mom went on Pinterest and found a recipe/craft for extra big bubbles that we could make with pipe cleaner wands. Supposedly they were supposed to come out in the same shape of the wand, but that was a Pinterest FAIL, which reminded me of this post. My mom isn't crafty at all so I give her mad love for trying! Pinterest bubble shape fail. Still made some pretty big bubbles though! We wrapped up our vacation with a two days in Minneapolis. It was a major win to break up a 2.5 hour drive and a 2.5 hour flight with a few days in between! We were able to see some family and get Henry and Otto together with their cousins, and I was able to see two of my friends and eat two fabulous meals. I tell you what, Dallas is NOT a "foodie" city like Minneapolis is. I miss having a good food scene! Alas, we have young kids so I doubt we'd make it out much anyway... But still. Dallas, pick up your food game! And then we flew home. Another uneventful flight. And uneventful is the BEST way to fly when you're toting along two little kids. Y'all know I LOVE me some Burt's Bees. I use nearly all their products, from moisturizer to blemish sticks to baby shampoo on the kids. And now a spin off company, Burt's Bees Baby, just launched adorable clothes for your infants and toddlers! I mean, these clothes are super cute. Ridiculously cute. And they use 100% organic cotton, so your littles will stay nice and comfy all day long - especially as we transition from the hot summer to the cooler fall, and temps can be cool in the morning but soar in the afternoon. Just check out how cute Burt's Bees Baby fall line is for your baby! I mean isn't it adorable?! The green striped pantsuit has a hood that's almost too cute to tolerate. The grey pantsuit had some eyelet detailing that didn't show as well online - it's the white around his collar. It's not overly feminine, and in fact would be the perfect shower gift for someone who isn't finding out the gender of their baby! There's wooden button detailing and the texture of the grey fabric is modern and fun. The blue onesie is my favorite! When worn with some baby jeans, it will look like he's wearing just a tee shirt, not a onesie, yet unlike a tee shirt it will stay put! Mamas, you know what I'm talking about. 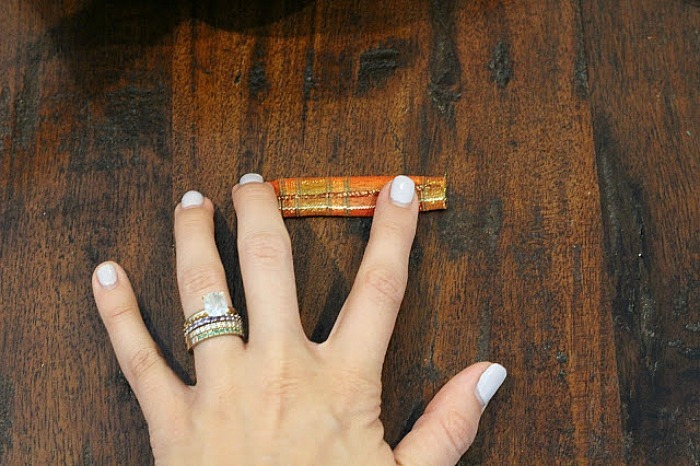 One note about sizing: SIZE UP. I *thought* I sized up for Otto but as you can see, everything fits him perfectly right now. He's 18 pounds and 28 inches (90% for height, 30% for weight) and wearing a size 12 months for reference. Burt's Bees Baby size 12 month fits like other brands' 6-9 month sizing. One thing I love about their sizing is if you have a long lean baby like Otto, the pants and the arm lengths are long enough while the middle section is slender enough! Thank you lawd, somebody informed designers that not all babies are short, stubby and fat! If you do have a chunkier little one, there's a lot of natural stretch in the organic cotton, but I'd still size up. Henry normally fits perfectly in a 2T and this is a 3T; he's 29 pounds and 36 inches. If you have a little one(s) you have to check out Burt's Bees Baby for their fall style line! It's beyond cute, they use 100% organic cotton, the colors don't fad after washing or bleed onto other clothes, and the styles are on point. Bring on the fall! Yup, I'm coming back from my summer vacay to jump right into... FALL Y'ALL! Here's some fact-y-truth: I wasn't going to start talking about fall until September. I realize it's August. However, I also realize that stores are now stocked with tons of fall goodies, and if you want the best selection, you gotta shop now! I remember the first year we moved to Dallas, I didn't even attempt to get the dogs their Halloween costumes until October. I went to a pet store and they were already tearing down Halloween for Christmas... I learned that the best preparers are the early preparers. So, here I am in August, blasting you with a fun DIY. It's cool, if you don't like fall, we'd probably not get along anyway. 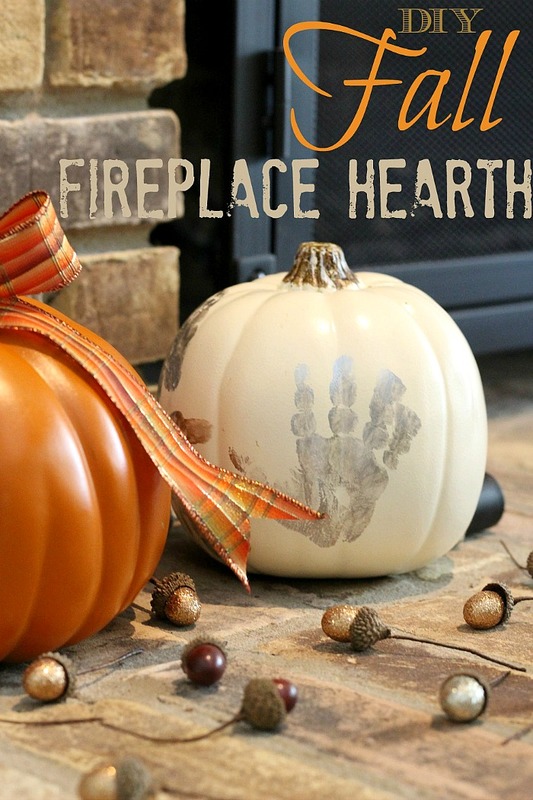 If you do, then check out this sweet DIY fall fireplace hearth. It enables you to make some memories (and mementos) with your children by decorating together. Fall is still far too warm here to use our fireplace, so I feel comfortable decorating the hearth. We likely won't have a fire until December, which gives me plenty of time to cover it in all the pumpkins and glitter! Sorrynotsorry, hubs. Also critical to the South is to not use real pumpkins. No kidding y'all, I learned this just last year: The heat makes them rot. And rot fast. So while this would be more fun with real pumpkins, I bought fake for longevity. The bonus is that I'll have them for years to come, and will probably get all sentimental on too much wine with how little these hands and feet are compared to how big my boys have gotten. I'm reminiscing and my children literally just did this craft two weeks ago. Anyway... On to the DIY! - A wet rag you can use to immediately wipe the paint of your children's hands because those kids move quick and want to get that paint on EVERYTHING. Apply the paint to your children's hands or feet liberally. 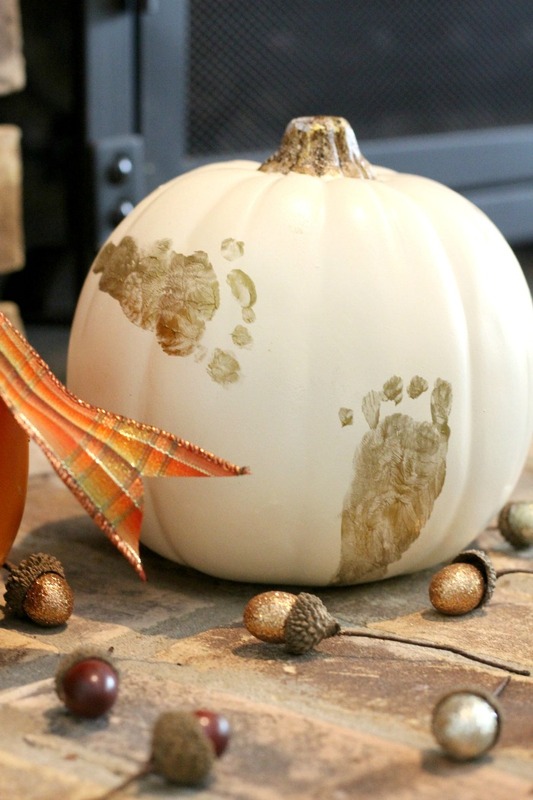 Take your faux pumpkin and stamp their painted hand or foot on it. I got two stamps out of the paint application before I needed to apply more. Be as fast as you can with stamping the pumpkin, as the plastic is slippery and the print gets distorted if your child slides his or her hand around. I found that the younger the child, the easier it was to use feet instead of hands. Henry is 2 and was juuuuuuust barely old enough to not be too squiggly for the hand print. Feet are definitely easier for babies and toddlers! The excellent part of acrylic on the plastic pumpkin is that if a print gets smeared, just wipe it off and try again. The paint will come right off so it's easy to do a few "practice" stamps before you start to get some good ones. Let the pumpkins fully dry, about 2-3 hours. You can do what I did and do a combination of painted and non-painted pumpkins, or paint all of them. After they're dry, tie bows on the stems. First, I cut the ribbon into equal lengths for each pumpkin. Then I tied them on to the stems, using a knot just like you do when you tie a shoe. With the shape of my pumpkins (short and wide) I found that it looked best with a small bow with long end tails, so I shorted the round part of the bow. To make the bow more pretty, I cut about a 2 inch piece of ribbon, then folded it in on itself into thirds. I then wrapped that around the center knot. This ribbon had small wires along the edges, and that was enough to keep the piece around the center. 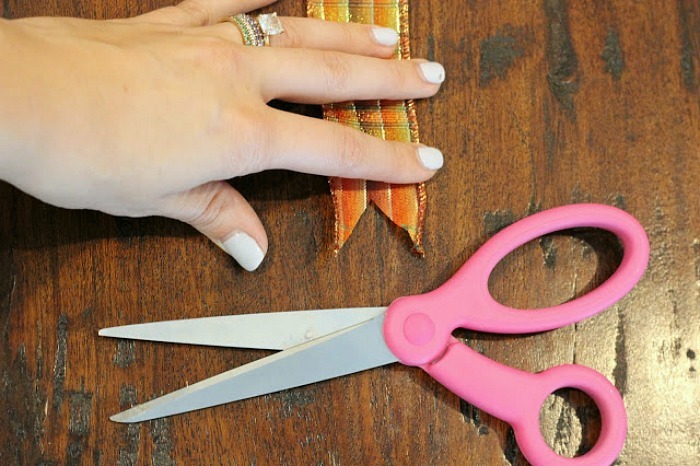 But if your ribbon of choice doesn't, use a glue gun and adhere the decorative piece over the center knot of the bow. Finally, I cut a deep V into the ends of the bow for a more polished look. This also helps the ribbon from fraying, so yay bonus! From this point, it's all up to you how you want to arrange them! I found some glittery acorns at a craft store that I thought were fun, but my toddler also found them fun so they're being moved into a glass bowl on our formal dining room, lest they end up all over the house and half chewed by dogs and tots. I have some additional pumpkins to add to this mix, but they're more Halloween than just a simple fall, and hubs' eye roll game would be strong if I started decorating for Halloween before mid-September even hit. I'll add those to the mix once it's time! The ribbons can also be switched out to a more Halloween-themed ribbon. Just keep the bows in storage for next year, because that decorative ribbon aint cheap, amirite? 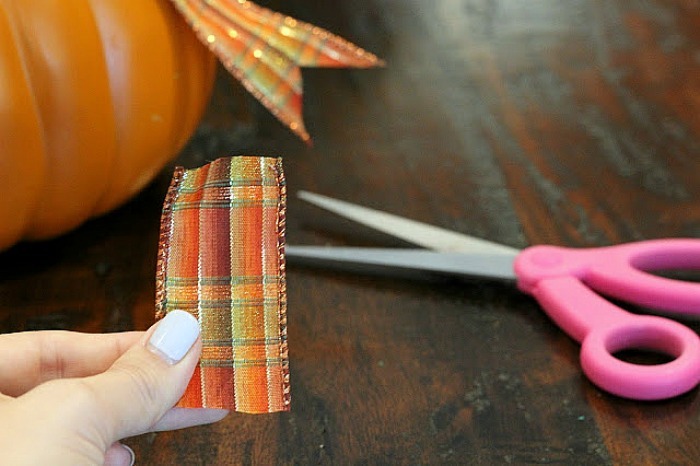 You could also keep these out through Thanksgiving and add gourds to make it more seasonal. Want more tips on crafting? Check out my Products I Love page! 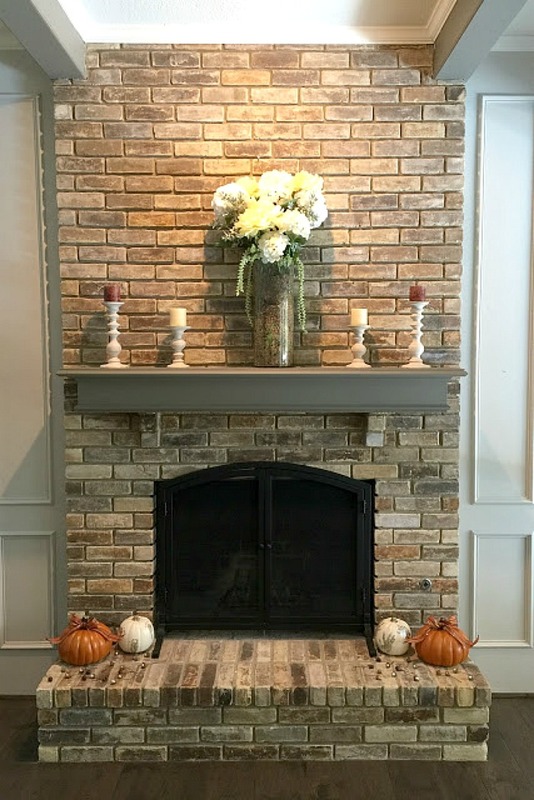 This DIY fall fireplace hearth is easy to do! 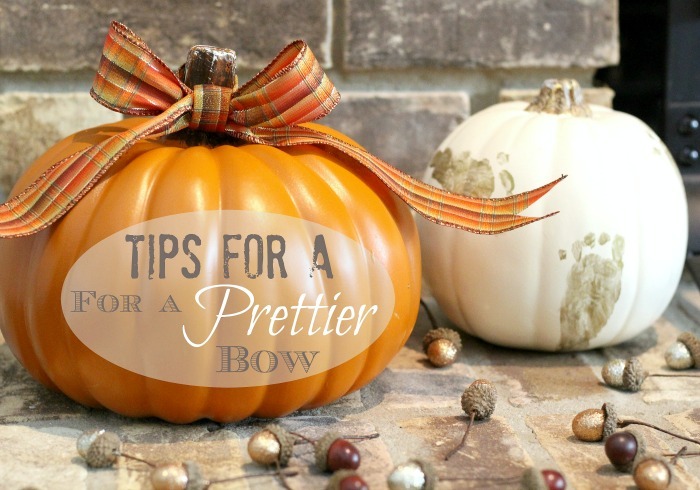 The painting only takes about 15 minutes from start to clean up (my timed pace for two kids and two pumpkins) and my bow hacks make tying your own ribbon easy. They're great to transition into Halloween and into Thanksgiving, too. Happy Fall, y'all!